We knew the storm was coming toward us, but we didn’t know it would be so strong and large, and even today we continue adjusting to the loss of many homes and businesses. Hurricane Michael made landfall on Wednesday, 10 October 2018; the storm lasted all day long. Three days before, weather forecasters had warned of a tropical storm, then it became a hurricane, in the Gulf of Mexico. The Monday before, we were “in the cone”, so people bought water, food, and gas for their vehicles as standard preparations began. Some people decided to leave town and made their plans to evacuate. Many of us thought this would be a typical storm; that it may reach category 3, and we decided to stay. On Tuesday, the hurricane became a category 3, and was headed straight for Bay County, Florida. We still had time to get out of town, but my dear friend was taking care her elderly parents, so we stayed. My friend’s mother had been in hospice condition at her home since early September, and her father (92) was easily confused. Routine was very important to them, since they both had dementia, and we knew the mother was likely on her last few days of life, with Alzheimer’s and a perforated bowel, so she was very weak. That Tuesday morning, the hospice nurse asked my friend about her plans to evacuate the parents and offered the option to take her mom to the hospital in town with other hospice patients (4 to a room and one caretaker per person). My friend’s parents had been married for over 66 years and she did not want to have them separated at this final stage of their life journey. Keeping the parents together was important to her. We had a vacant rental house close to our main house, and decided to keep her mom there instead of choosing the hospital option, which turned out to be a blessing in disguise. Putting our fears aside, we got busy moving the parents to the rental house. We borrowed another friend’s hospital bed, and bought air mattresses to sleep on. A lady who took care of her parents for many years, joined us; she packed up her mother’s personal items, wipes, oxygen and medical supplies, and all medications. We set up the hospital bed, and friends brought in a few chairs and tables. We got a television to keep up with news and weather reports in our temporary abode. Then, we went to get my friend’s mother, who was frail like a bird. We were afraid we would break a bone, or worse, but we worked together to pick her up, putting her in the back seat of the car, and drove slowly to the house, her being propped up by pillows. Finally, we carried her into the house and placed her on the hospital bed, and tried to make her comfortable. She moaned a couple times, but we were relieved to have her moved safely, and felt like the hardest part was over. The storm was still looming, several miles away! 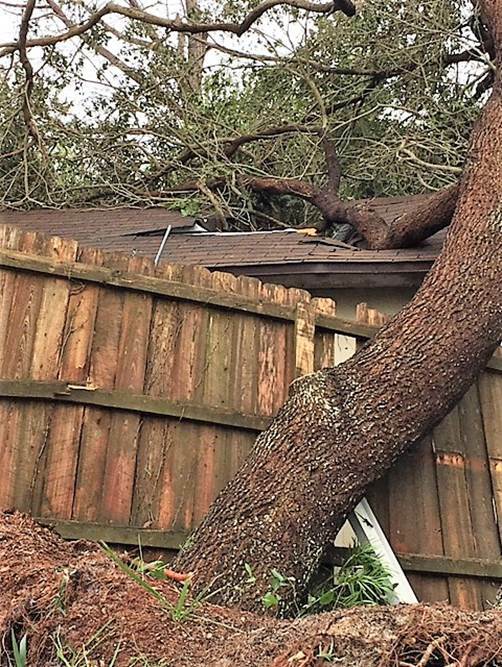 Wednesday morning, Hurricane Michael grew to a category 4 and was quickly moving towards Panama City and Panama City Beach for landfall. My friend went to pick her father up. He did not want to leave his home, but he knew he would have to join us if the weather got bad. I packed up more things to take to the house and decided to cook a couple rib eye steaks for lunch because I knew we would lose power at some point. We ate lunch at 11am, and by 1130 am the winds were blowing so hard, I decided to stay in the house with them; better to stay together! Three of us ladies, plus my friend’s elderly parents, rode out Hurricane Michael in that house. We watched the television until our power went out about 1pm. The winds got so strong (I am guessing 130+ mph sustained on Panama City Beach – much stronger in Panama City). The storm raged against the house for over 5 hours, strong winds and rain pounding against the front door and windows. I thought they would blow in on us a few times but, thank God, they stayed shut! We set the dead-bolt lock, and stayed in the center of the room. I went into the little bathroom and prayed hard when I felt anxious, determined to regain my serenity. We watched out of the back window for hours as huge oak trees swayed and swirled in the forceful wind, finally succumbing to the barrage. Three big trees were picked up by the roots and fell together across our driveway, and they fully covered the street in front of our main house. Rain beat down hard and fell sideways, blowing from North to South like everything else! It was crazy to watch – we would gasp at times, not believing our eyes or not sure of what we heard. We saw shingles flying off the roofs, eave drips peeling up like potato chips from the roof edges. We saw one of our shed doors ripped off the hinges. Then, we saw a couple of large oak trees in the back yard of our house taking a beating. They swayed South and twisted like swizzle sticks, and finally fell over. From my vantage point, I could not tell if they hit the main house but I felt it was likely that they hit the roof and everything in my bedroom would surely be damaged. I am amazed when I remember that I was worried, but willing to accept something like that, in advance. I guess when you can’t do anything about it, you accept it – I’m sure many can relate. When the winds tapered off about 4:30pm, we walked over to the main house to survey damages. Those large oak trees did not hit the main house, which I consider to be a true miracle! I ran upstairs, amazed to look at my dry bedroom and got on my knees and thanked God. The trees that fell to the South knocked over the 8-foot privacy fence, and landed on my neighbor’s carport roof. I called him to see how he was doing. We met him outside and looked at the damage and he was so sweet about it. Our neighbor friend, Mike, was more worried about the squirrels not having their homes because those large oak trees had nests, and now the squirrels were displaced! He said “…we’re alive and safe - that is all that matters”. I was so glad to see he was okay; he was 78 years old and on his own. We walked around some more and talked about what to do to start cleaning up. The power stayed off for five days, but we got a generator and some gasoline (from friends). Thank you, Lisa S. for making a gas and food run to Pensacola! She had called me to see what I needed and that is so much appreciated. Some Mormons from Fort Walton showed up with chain saws on Thursday morning. They were a large group, all ages cutting trees – and pulling branches to the side of the road. I joined in to help pick things up and pull branches. It was the most amazing feeling of gratitude to have people just show up in the neighborhood and start clearing debris from the streets. Their selfless hearts and smiling faces kept my spirits up that day! Thank you to the Latter Day Saints! On Thursday, our neighbors who work at Sacred Heart (Bay Medical) told us that the hospitals in Panama City were severely damaged, and they were arranging transport of all the patients to go out of town. We told them of her mother, who was in a hospital bed in the rental house, so they went over to check on her. The neighbors told my friend, “it’s a good thing you kept your mom with you”! Ambulances and helicopters were heading to hospitals in Fort Walton, Pensacola, etc., taking patients out of the damage area to where they could be treated. We knew then that my friend’s idea to keep her parents together was a blessing – who knows where her mom would have ended up! Many people and pets were lost to their families for weeks after the storm, which made a tough time even worse. We were very fortunate to have stayed together and have no major damage. The main house needed a roof, and fences were all down, but those things are material. Family and friends were still together and safe. Friends at the Yana Club were okay too. Even though there were damages, people came together to cut trees, clean up debris, and cover holes in the club. We talked about how we needed a meeting! Friday turned out to be a sad day. Our neighbor friend Mike, his dogs were barking and that got the attention of some people who went to his back porch and found him, slumped over in a chair by a table. The ornery son of a gun had been tinkering with his tools, getting them ready to clean up his yard, and he accidently cut himself with a knife. It looked as if he tried to stop the bleeding, but he took blood thinners, so he bled out. The man across the street told us about Mike. We cried and waited for the police to come and do their report. The police told us that there were so many people to attend to that they might not be able to move his body for a few days, and we could not move him (out of the sun). Medical examiners came in from other towns to make the final determination of cause of death for people. His dogs were in distress, so the neighbors took care of them. Friday afternoon, the medical team came and took Mike’s body. He was a character and we miss him; he was a blessing to me many times. I feel like he is at peace in his creator’s loving arms. I am grateful to be moving forward, one day at a time! AA told me its "Just for today"
Our Beach Unity Group (BUG) has always met in a building named YANA Club, a 501c3 organization dedicated to providing a place for recovery to AA and other 12-step organizations. Our beautiful YANA Club building had lost some roofing shingles exposing the roof decking. A big sycamore tree out back came down, fortunate to fall harmlessly in the parking area, and partially in our neighbors’ back lot. This along with the sheer scope of destruction everyone was witnessing brought home the powerlessness that we all live with every day. We started having our regular 5:30 meetings about four days after the storm. The other organizations (NA, OA, SA) meeting there later in the day had to cancel due to the curfew. In those first few days, Mike B managed to get a tarp on the roof to curb the inevitable leaking rain, and Harold G used a chainsaw on the big sycamore tree to clear out the parking area. While clearing debris and doing our repairs, we all met our neighbors in way that we had not before, having a common burden. Some BUG members discussed with the YANA Board how to handle repairs. The building had insurance, and was originally intended primarily for liability. The policy simply did not cover wind damage. We found out later that this arrangement is common for most businesses in town, due to costs. The YANA Board discussed bake sales, fun dinner events, and a number of fundraisers. We all knew there would be roof repair companies in this area for many months to come. Earlier in the year, the YANA Board members had talked about getting a new metal roof. So in one of those meetings after the storm, a prayer was requested; a prayer for a new metal roof for the YANA club! Although we may not like the situation, knowing that everything is exactly the way it is supposed to be at this moment, and that nothing, absolutely nothing happens in God’s world by mistake, allows us to confidently place our lives under the authority of that great power and find serenity. Our little meetings have always had visitors from other towns; spring breaker crowds in the summer, snow birds in the winter. We quickly began to have visitors who were in town doing clean-up, repair, volunteering and restoration work, grateful to have a meeting to go to. They began to share about being out in the community, helping where they can, and witnessing families living on their front lawns with all of their salvageable possessions. We could see the humility in their stories. One visitor said she was from New York, did not want to divert her vacation. So she and her family ended up here volunteering to help. She said that her brother (not one of us) gave her a ride to the meeting, and wanted to know why she would go to a meeting to listen to people cry about their woes. She shared that during this meeting she had seen the spirit of hope, and witnessed folks that really care about each other. She said, "that muscle of endurance that gets flexed all the time at meetings, so that in our time of need it is really there". WOW! So grateful to God and AA for where I am right now. In a matter of days, our BUG group found some extra dollars when we passed the seventh tradition, and the YANA Club had some donations from supporters. We found that The YANA Club roof repair (phase 1) could take place on November 17th, 38 days after the storm! With sufficient donations, the materials were purchased to repair the flat roof over the break area, the part that had the most damage. This effort would solve the leaky roof problem. There was discussion about getting shingles to replace the missing ones on the pitched part of the roof over the meeting room, and we would continue to call for prayer for a metal roof covering for that part. Insulation and sheetrock repairs would still be needed for the break room and kitchen. The other 12-step recovery groups began to have their meetings, as the curfews began to ease. Other clubs in the area began coming back online. We heard that “Central” had a meeting, “The Trailer” was meeting without bathroom facilities, and others were accomplishing what they could. A little at a time, every day we began to see some improvement. This town will never be the same, sad and exciting at the same time. During this time, there began to be talk that an out of town roofing contractor had heard our prayer, and was willing to fix the rest of our roof, on their tab. As the days passed and the contacts were made, we discovered this indeed, was true! One of the roofing contractors in town looking for a meeting, found us and heard our prayer. Almost without hesitation, they decided to fulfill that prayer! On November 27th, 48 days after the storm, the [removed to protect anonymity] company installed a beautiful metal roof on the YANA Club! These guys “lost interest in selfish things, and gain interest in their fellows” in truth and in deed! These people who own this company, both in recovery were showing rare courage, and love for others that we will never forget. Our next order of business was to show our appreciation. The YANA Club decided to fund a dinner in honor of the roofers, so a date and time was quickly decided and we began announcing the dinner invitation at meetings. One of the members decided to go to a local banner/print shop [removed to protect anonymity] , to get a plaque made expressing our gratitude to the roofers. As it happens, this business was once owned by the founder of the YANA Club. They made a beautiful plaque for us and did not even charge for it! 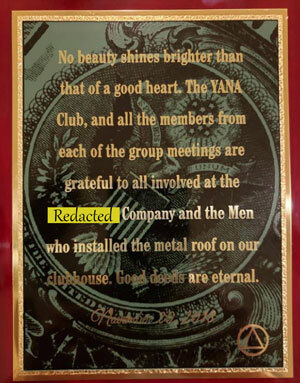 The YANA Club, and all the members from each of the group meetings are grateful to all involved at the [removed to protect anonymity] Company and the Men who installed the metal roof on our clubhouse.